It’s been a while since I’ve tended my blog. Unlike my houseplants, I hope it’s hanging in there! I’ve been busy being with my mum, who is staying with us this month. 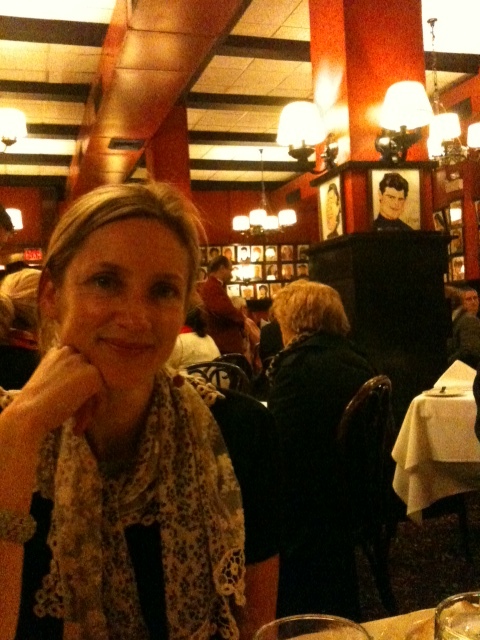 Last week we checked off one of the few things on her ‘to-do’ list and went to the theatre district. I took her to see Peter and the Star Catcher at the intimate (by Broadway standards) Brooks Atkinson Theatre on 47th Street. The actors were fantastic, the play was great – a kind of scripted theatre sports of a kids story for adults (it’s about how Peter Pan came to be). Then she took me to Sardis. 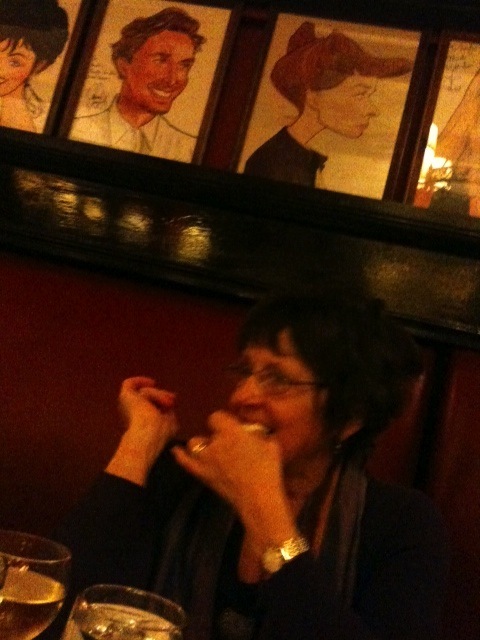 The theatre district stalwart would not have been my first choice but for mum, it was part of a package. She and Dad had been when they came to New York in 1998. “I’d just love to Go to Sardis and See a Show while I’m here,” she told me several times before she came. At 9:45 we walked into an almost empty restaurant. Most of the staff were hanging around the Little Bar, a cloak-room/ entry-way/ bar at the front, watching Obama’s second debate with Romney while a handful of diners finished up their theatre-district dinners. The huge round room was carpeted red, lined with dark red wood-panel walls crammed with characatures of broadway actors. It was just the way she remembered it. We sat at the table in the back and mum looked over my shoulder to where she and dad sat last time. An older couple from Texas were shown to a table so close, the four of us felt we’d been dumped on a communal table, which was odd considering the empty restaurant. But they were enjoying each other’s company so much it was hard not to enjoy theirs. Full of contentment and southern charm and with their Lion King Playbill between them, they only stayed long enough for a glass of wine each and a dessert for the wife who was celebrating her birthday. They were having a wonderful evening and so were we. Our supper: a more-than decent malbec, oily and too-rich french onion soup and an entirely forgettable dessert, was probably the best either of us will have this visit. Special Places being what they are, it was never really about the food, or even the place. I wish dad could have been there as well, or in my place (there’s a long post about U.S health insurance, to tackle another time). I’m sure mum and dad both do too, but we walked out to the cab-flagging frenzy on 8th Avenue and I felt that between the three of us and 14 years, it had been a great night. By the time we left, the restaurant had filled almost to capacity with the post-show crowd, half of them tourists ticking off their New York guide book’s ‘must do’ list, some of them older New York show regulars, who come because they’re regulars, and a few like our new friends from Texas, who will go home and remember where they sat when they had that lovely evening at Sardis.